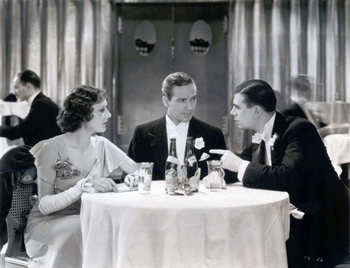 Produced in 1932, Crooner is the first film where DM receives top billing. He stars as Ted Taylor, a saxophonist in a run of the mill band struggling to make a name in the New York nightclub scene. By chance, he is called upon to sing a number, and being handed a megaphone due to his low vocal projection, becomes a "hit." Judy Mason, (Ann Dvorak) a college friend of Ted's, (who also happens to be in love with him) convinces Peter Sturgis (Ken Murray) to become Ted's manager. Sturgis is the biggest agent in the business and knows all the tricks for turning mediocre performers like Ted into huge sensations. Mainly because Peter is in love with Judy, he works his magic and makes Ted "all the rage." Unfortunately, however, Ted's ego inflates to a point where he alienates himself from all those close to him, including his band-mates and Judy. When he causes a riot in the nightclub after "socking" a heckler who turns out to be a crippled war veteran his fall from grace is complete. Ultimately he lands back where he originally was, playing saxophone in a Harlem orchestra. After hearing on the radio the announcement of Judy and Peter's impending marriage, he calls her with good wishes. Realizing it is Ted and not himself that Judy really loves, Peter arrangers for them to meet and the two get back together, Ted having been sufficiently humbled. Crooner is a great film and remains enjoyable throughout. DM's transformation from a likeable, loyal, and hard-working bandleader to an egomaniacal bore is entertaining and quite humorous. As Peter Sturgis says, "Its like hooch, some can carry it, some can't."